Rio Grande’s Chase Davis (9) works the ball up the sideline during the first half of Wednesday’s 3-1 loss to Campbellsville University at Evan E. Davis Field. Davis scored the RedStorm’s lone goal in the loss. RIO GRANDE, Ohio — Moments after the University of Rio Grande took away Campbellsville University’s early momentum, the Tigers stole it right back. An own goal off of a corner kick opportunity just under four minutes after the RedStorm’s game-tying score fueled an eventual 3-1 win for the visitors, Wednesday evening, in non-conference women’s soccer action at Evan E. Davis Field. Campbellsville improved to 5-1 with the victory, notching the second-best start to a season in program history in the process. Rio Grande slipped to 2-3 with the loss. The Tigers grabbed a 1-0 lead just 1:05 into the contest thanks to an unassisted marker by Rachel McWilliams, but the RedStorm tied the game with 24:57 remaining in the half on a breakaway goal by sophomore Chase Davis (Huntington, WV). The tie was short-lived, though. Campbellsville grabbed the lead for good just 4:37 later when Rio senior goal keeper Kelsie Lee (West Chester, OH) inadvertently deflected a corner kick by McWilliams into the net. Lee, normally one of the RedStorm’s starting forwards, was pressed into service at keeper as a result of injury suffered in practice by senior Andrea Vera (Quito, Ecuador), the team’s regular net-minder. The Tigers added an back-breaking insurance goal with just 11:35 left to play when Claudia Eckstein found the back of the net from just inside the left wing of the 18-yard box off a pass from Kiersten Clukey. Campbellsville finished with a 28-14 edge in shots overall, including a 16-7 advantage in shots on goal. The Tigers also recorded seven of the match’s nine corner kick chances. 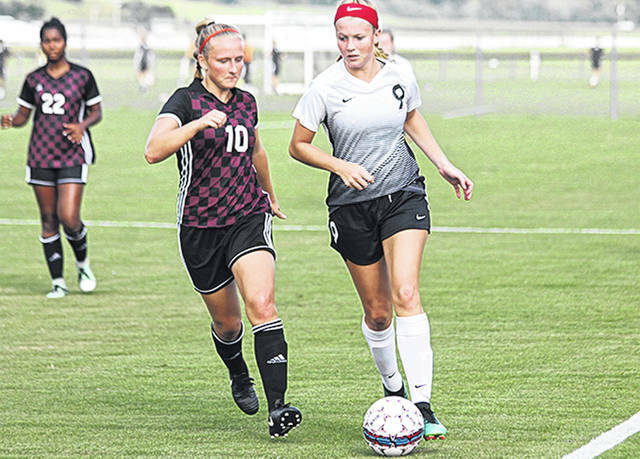 Katelyn Young had six saves in the winning effort for Campbellsville, which avenged a double-overtime loss last season to their former Mid-South Conference rival. Lee had 13 saves in the loss for Rio Grande. The RedStorm return to action on Saturday, traveling to Goshen (Ind.) College for a 4 p.m. kickoff.